CENTRAL PARK, Manhattan (WABC) -- The tree that fell on a woman and her sons in Central Park Tuesday came down as a result of rotted roots, the Central Park Conservancy said. 39-year-old Anne Monoky Goldman, a resident of Midtown, suffered a fractured vertebrae after getting hit by the tree near Central Park West and West 62nd Street. Her 2-year-old son suffered a fractured skull, while a 4-year-old and a baby had facial bruises. 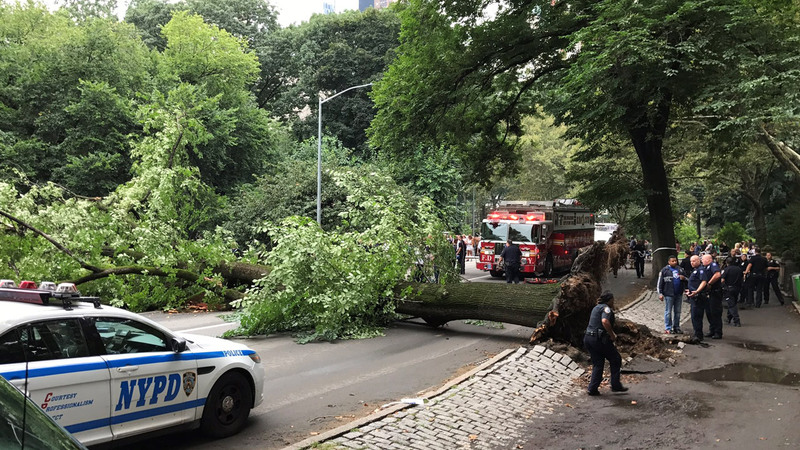 The American elm that fell was "uprooted as a result of decay in the root system beneath the surrounding pavement", the Central Park Conservancy said. It added that the tree had been inspected annually over the last six years, most recently in November 2016, and there were no visible signs of decay or disease. Four mounted police in the area heard the crack of the tree and watched it fall, and found Goldman trapped under the tree by branches. With the help of good Samaritans, the officers removed the branches from the woman and kept her in place until EMS arrived. The Conservancy said it employs tree crews seven days a week who regularly inspect and maintain Central Park's nearly 20,000 trees according to industry standards.